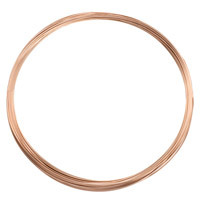 Our Rose Gold Filled wire is 14/20. This means that 1/20th of the weight is 14 karat Gold. Remember the higher the gauge number, the thinner the wire. 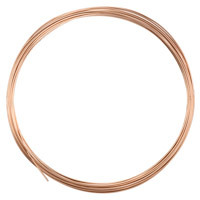 For reference, the standard gauge of Rose Gold Wire used to make earrings is 20 gauge. Half-Hard Wire - Some stiffness and retains its shape when bent. Ideal for earrings, clasps and hooks. 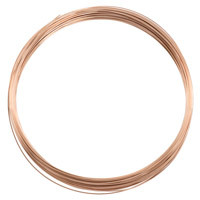 Our Rose Gold Filled Wire is sold by the foot via “Wire-on-Demand.” We have a maximum length per coil of 10ft. For example: If you order “25 feet” of wire you will receive two 10 foot coils and one 5 foot coil. Because wire has a tendency to retain it's shape, this is the optimum length to avoid kinking or binding when uncoiling.